I run courses for women. It’s my passion. I have courses for women looking to move up into senior roles, courses to give women more confidence to do whatever they want to do, and courses for women who want to plan ahead for their next 12 months. I also devise other personal development type courses for organisations which work for both genders (for example, when companies are experiencing radical change). 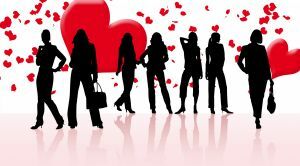 However, my original love is working directly with women and helping them boost their confidence and achieve success, in whatever area they choose. I am sometimes challenged as to why I exclude men. Well, the answer is I don’t exclude men. The material for my courses has been designed and written by me with women’s issues in mind but men are most welcome too if they feel it will be useful. And often I do get a chap or two attending and it goes well. Not all men are bursting with confidence and aiming high, just as not all women are lacking in confidence and not going for promotion. But statistically we know that the upward path is strewn with more obstacles for females than it is for men. It’s overcoming those obstacles, increasing confidence both to change oneself and to challenge discriminatory practice, that I focus on. My information is aimed at women. For example, I make reference to the fact that women tend to wait until they know their current job really well before applying for the next grade up. That isn’t something that generally applies to men who will take a punt on a higher grade role if they meet just some of the requirements. Incidentally, I coach both men and women on a one to one basis I don’t find any difference at all. It’s in group situations that the different needs are obvious. And I am talking about different needs, and not suggesting that one is any better than the other. Men and women have different personal development issues. Women, generally speaking, when looking at personal development, want to talk about different issues to their male counterparts. I am not advocating women only groups in every circumstance, far from it. The surest way to keep women out of the boardroom is to make all the issues round flexible working, more adaptable systems, etc purely women’s problems. These issues need to be part of a larger dialogue within organisations, not ghettoised as ‘women’s problems’. Companies report a significant increase in profits and all employee satisfaction when obstacles to women’s advancement are removed in an organisation. Everyone needs to be involved in that. That said, companies often bring me in to run women only courses as part of initiatives to have their senior management teams gender equal and to improve their bottom line. If an organisation has not previously encouraged women, albeit often unwittingly, then women only courses can be a huge support in managing the change. As can personal development courses for men only! Women and men respond in different ways to my type of seminars. They listen differently, and they want different things. For example, if I am working with a group of men, generally speaking, they want to know facts, and why something is true. I always marshal my sources and give them chapter and verse as to research, origins etc. They are less comfortable sharing more personal stuff with other men, especially in relation to work. Women, on the other hand, (once they have assured themselves that I know what I am talking about), respond much more intuitively and don’t want too much detail. They are interested in the applications of the research, not necessarily the pure research. They enjoy talking with other women (see here for some research on why that may be) and are supportive and encouraging of each other. Interestingly, my experience is that men like to discuss personal development with women in the group, while women prefer it to be with women. And sadly, women are often less vocal when men are in the groups as well. In short, men enjoy mixed groups and get a lot out of it, while women, while enjoying mixed personal development seminars, get more out of it when working with other women. And that’s why I run personal development courses specifically aimed at women! If you’re interested in any of my courses, or would like to book one for your organisation, do give me a call, on 01761 438749.